The various Browning automatic pistols have been the most emulated automatic pistols in the world, particularly the 1903 Colt Pocket “Hammerless”, the 1910 FN Browning, and the 1911 Colt. 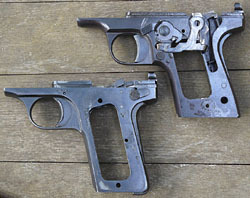 Part of the beauty of Browning’s designs was their relative simplicity, but most cheaper copies of the Browning were further simplified in order to reduce manufacturing costs. The MAB pistols are an exception in that they retain most of the features of the original Browning designs, and in a few cases the MAB designers actually added features. 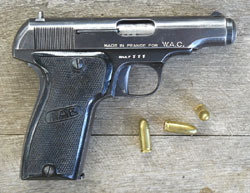 The MAB Model C is clearly based on the 1910 FN Browning, and the MAB Model D is simply an enlarged version of the Model C (corresponding more or less to the 1922 FN Browning). I will speak here of the Model C, with the understanding that Model D features are identical except for the size of certain components. 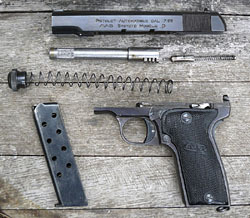 Most Browning copies do not retain Browning’s excellent stirrup-shaped connector, which provides for a very smooth single-action trigger pull (exceptions are the Polish Radom and the Russian TT-33 Tokarev). 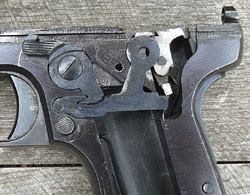 The MAB uses a design that appeared on many Spanish copies of the 1903 Browning--a single connector bar running on the left side of the gun from the trigger to the sear. The disconnector is a right-angle extension from the connector up to the slide, so that when the slide is out of battery the disconnector forces the connector down and out of engagement with the sear. On the 1910 FN Browning the disconnector is simply a small projection on the left-side top of the connector, but functions in exactly the same way as the Spanish copies. The design of the sears is quite different on the two guns, as is the release mechanism, which I am unable to describe in detail. Like the Spanish copies, the MAB moves the manual safety to just above and behind the top of the trigger on the left side of the gun. This is a much more natural location for engagement and disengagement by the thumb. However, on the Spanish copies the forward manual safety only locks the trigger--if the gun were dropped the sear could be jolted and still release the hammer--whereas Browning’s designs feature a grip safety that locks the sear and prevents either the hammer from falling (on the 1903) or the striker from being released (on the 1910); the manual safety on the Browning guns locks the grip safety, which in turn locks the sear, whereas the vast majority of Spanish copies do not have a grip safety. The MAB takes the best features from both designs. Its forward-mounted manual safety rotates upward to lock the slide and a corresponding hook under the left grip rotates down to lock the connector. The MAB retains the grip safety of the Browning, which locks the sear, so if it is dropped it is unlikely to go off whatever position the manual safety may be in. The MAB has a magazine safety, as does the 1910 FN Browning, but the MAB’s magazine safety functions differently. The Browning magazine safety simply locks the grip safety when the magazine is removed. 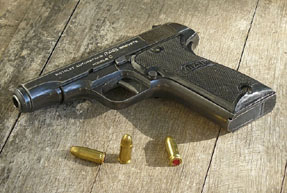 The Model C safety is like that of the Model A. 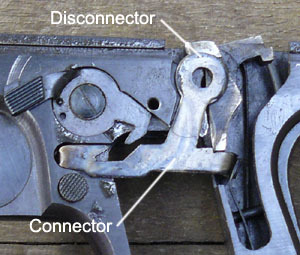 A spring-loaded L-shaped lever is placed between the back of the magazine and the front of the sear. When the magazine is withdrawn this lever springs forward and away from the sear. 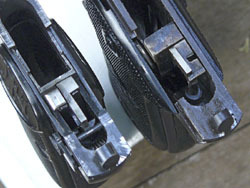 The magazine, when inserted, presses the lever back to provide a fulcrum that allows the motion of the trigger and connector bar to rotate the sear downward and release the striker. Without this fulcrum, the sear cannot rotate downward. Both guns have a bushing at the front of the slide to retain the recoil spring. The FN requires a tool (spanner wrench) to press this bushing in enough to rotate and remove it. However, the MAB has a spring-loaded latch on the bottom of the slide that fits into one of two slots on the bushing. Pressing the back of the latch lifts the end up from the slot in the bushing and allows the bushing to be rotated and removed without a special tool. In later production, this latch was eliminated, but the MAB bushings did not require a tool to remove--they could be pressed in by hand and rotated. The FN has its magazine release on the bottom of the grip, whereas the MAB emulates the 1911 Colt--the magazine release is a button on the left side of the frame just behind the trigger. This design allows the magazine to be released one-handed, which is faster and more practical in a defensive situation. Sights are integral and extremely low-profile on the FN, whereas the rear sight on the MAB is dovetailed into the slide and is drift-adjustable for windage. The trigger on the FN is flared across the front to provide a greater area for the finger to press against and a smoother feel. The MAB trigger is not flared. The FN trigger pivots on a pin at the top, whereas the MAB trigger slides in slots in the frame. For a decade the only gun made by Manufacture d’Armes de Bayonne (M.A.B.) was the Model A in 6.35mm (.25 caliber). But in 1932 they introduced the Model B, and in 1933 they introduced the Models C and D, giving the company a reasonably complete line of personal defense weapons. The MAB Models C and D both went into production in September of 1933. 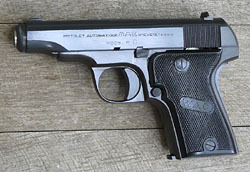 Production of the .380 version of the Model C ended in November of 1963, while the .32 was produced until November of 1967. Production of the Model D ended in 1964, but was taken up again in ‘66 or ‘67 until it was finally discontinued in 1982. 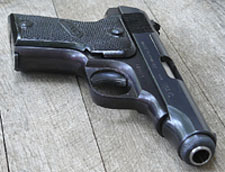 The Model C was based on the 1910 Browning, though it differs in details. The lockwork is different, and the MAB has a deeper (wider) grip with a slight curve to the backstrap, though the grip of the Model C is not quite as long, so it holds one less round than the Browning. The MAB feels better in my hand than does the Browning. The first Model C shown below is a .380, though the .32 chambering is more common. Interestingly enough, however, the .380 version went into production first. 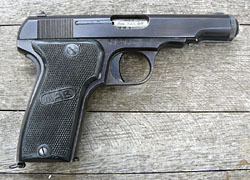 The Model D was an enlarged Model C, intended for police use, as indicated by the lanyard ring on the bottom of the grip. It corresponds to the Browning Model 1922, which was an enlarged version of the Model 1910. The Model D saw extensive use by the French National Police, French Customs, the French Forest Service, and the Bank of France. It also saw use limited use by the French Army in Indochina. After World War II M.A.B. 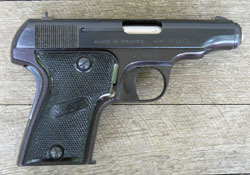 began making a Model C on a Model D frame, so the gun had the extended grip and magazine capacity of the Model D, but the shorter barrel and slide of the Model C. Huon calls this the model C/D. It is reminiscent of the Eibar or Ruby pistol, widely used by French forces during the First World War, which came in many configurations, the most common of which was with an extended grip. 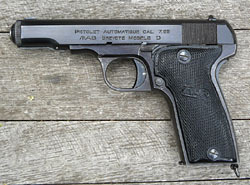 The second Model C shown below is a .32 “C/D” with an extended grip. 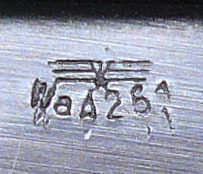 A late Model C in .380 caliber with WAC (Winfield Arms Corporation) markings. 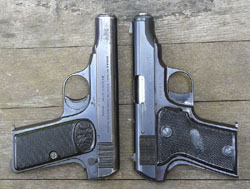 The .380 Model C compared to the Model 1910 FN Browning, which it was a copy of. 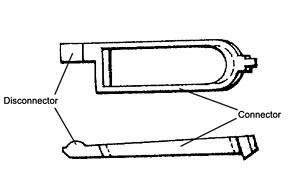 The MAB Model C/D (essentially a C slide on a D frame). At the range, I found the trigger on the .380 Model C to be a bit creepy. It is possible this could be improved with some polishing of the connector. Browning’s stirrup-shaped connector is hard to beat, but the M.A.B. mechanism is cheaper and easier to manufacture.. 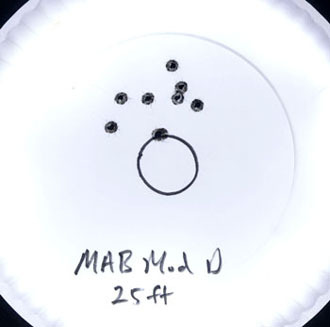 I was able to hold pretty consistent 3” groups at 25 feet with the Model C, but my 1910 FN Browning produces consistent 1” groups at the same distance. I might do better with different ammo. The Model C fed and ejected every type of ammunition I put into it. The quality of manufacture is very high. The manual safety lever locks the slide, the sear, and the grip safety. The trigger on my .32 Model C/D is better than on the .380, probably because the .32 has been shot a lot more. The .32 is also somewhat more accurate than the .380, delivering pretty consistent 2” groups. Whether that can be attributed to the smoother trigger, different ammunition, or simply better inherent accuracy is hard to say. I’m not a tremendously disciplined shooter, so someone else might do better with either pistol. A WWII era MAB Model D with Nazi markings. At the range the World War II era Model D shown above performed flawlessly. The trigger pull is hard, but the letoff is crisp. I found it would shoot consistent 2” groups at 25 feet. 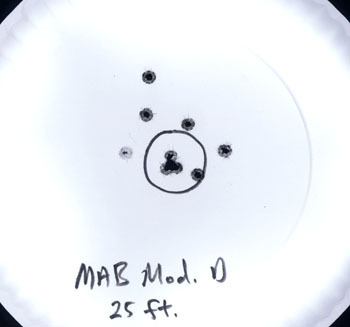 Typical 2” groups shot with the Model D at 25 feet. is fast and sure on the trigger. Free choice between ourselves and the world. From Qualcosa di preciso [Something Definite], 1961, poem by Bartolo Cattafi, 1922-1979--based on an English translation by Edward Stanton. Original Text in Italian. Clear the chamber (i.e., make sure the gun is empty), pull the trigger, and remove the magazine. Draw the slide back and lock it open using the manual safety in second detente on the left side of the slide. Turn the barrel counterclockwise, rotating the barrel lugs up into the slot cut in the interior of the slide. Release the safety and draw the slide and barrel off the front of the gun. Note: If you remove the grips, be sure to observe that the lower screw is longer than the upper screw, and they must not be reversed. Most of the late plastic grips will have shrunk and cracked at the screw holes, so be careful with them. Older hard rubber grips fare somewhat better but can still be brittle. “The M.A.B. Pistols,” by Michel H. Josserand. The American Handgunner, May/June 1979. Pistols of the World, by Ian V. Hogg and John Weeks. Arms & Armour Press, London: 1978.